« Anyone Know What This Is? Update: I found a bit more time to give some more background on First Solar and German feed in tariffs here. 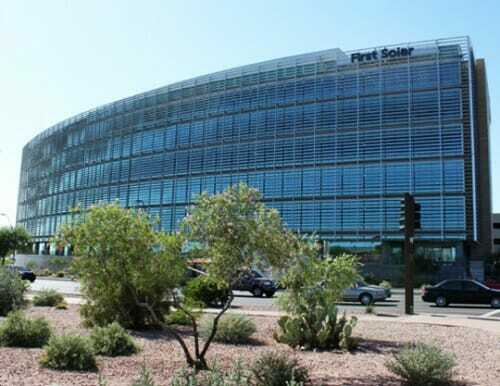 First Solar is an Arizona-based manufacturer of solar panels. In 2010, the Obama administration awarded the company $16.3 million to expand its factory in Ohio -- a subsidy Democratic Gov. Ted Strickland touted in his failed re-election bid that year. Five weeks before the 2010 election, Strickland announced more than a million dollars in job training grants to First Solar. The Ohio Department of Development also lent First Solar $5 million, and the state's Air Quality Development Authority gave the company an additional $10 million loan. In September 2011, Ex-Im approved $455.7 million in loan guarantees to subsidize the sale of solar panels to two solar farms in Canada. That means if the solar farm ever defaults, the taxpayers pick up the tab, ensuring First Solar gets paid. A small corporation called St. Clair Solar owned the solar farm and was the Canadian company buying First Solar's panels. But St. Clair Solar was a wholly owned subsidiary of First Solar. So, basically, First Solar was shipping its own solar panels from Ohio to a solar farm it owned in Canada, and the U.S. taxpayers were subsidizing this "export." During First Solar's boom years, the company was mainly supported by sales to Germany, probably one of the worst solar sites in the world after perhaps Seattle. But the German government mandated feed-in tariffs for solar that were five times (or more) the market price for electricity. It was like saying that, while milk generally goes for $2 a gallon, the government mandated that milk from brown cows could be sold for $10 a gallon, and what's more, consumers had to buy it. Germany has a huge industrial production sector and is densely populated. A significant portion of German Energy needs is based on imported coal, oil and electricity and existing infrastructure problems with internal Energy distribution (the existing networks are at peak capacity). Additionally, Germany had previous commitments to suspend coal and nuclear energy production inland and some interesting after-effects of network privatization (in essence the companies that bought the network infrastructure stopped all investment into maintenance and network buildup and jacked up prices, with the predictable after-effects; a reminder that privatization can work worse than government management if the incentive structures are set up incorrectly). As a result of the dependency on foreign energy sources, exposure to economical threats like Russia closing the gas pipelines is a real issue. The extremely high subsidies on sustainable energy sources (specifically wind and solar and to a smaller degree biogas) have led to a proliferation of local energy production (if you drive along the northern coastline, about every third house is covered in solar tiles and every larger meadow is full of windmills). As a result, 20% of energy needs can now be covered through local sources, with a profile that would be difficult to attack centrally (think attack on a single power station). This has a huge strategic impact, as it reduces the control of external agents. Not coincidentally, the subsidies have been in free fall since (with the predictable amount of complaints from rent seekers). This is one case in which it makes eminent sense for a state to subsidize some economic activity distinctively, and an example of this type of subsidy applied correctly (ie promising to keep the payment up forever to get the infrastructure built and then scaling it back once the strategic objective has been achieved and let market forces play). Opaque. The word you want is opaque. The errant court ruling in Miller v. ACC throws a wrench in the works of some legal opposition to the clearly abusive subsidies and cost-shifting currently going on in AZ, but a proposal (HB 2789) is working its way thru the legislature which would hopefully curtail this. It might be worthwhile to take another shot at the REST rule, possibly suing SRP (I’m unable to locate any subsidy information from their website or our bills). This column appeared in the Washington Examiner, and after reading Tim Carney’s column, “Firm sells solar panels - to itself, taxpayers pay,” readers might assume that First Solar sold panels to itself, and that taxpayer money was at risk. Neither is true. Though Ex-Im Bank did originally propose a financing arrangement to support the export of solar panels from our 1,250-worker Ohio factory to the project in Canada, the transaction recently closed without Ex-Im financing. No taxpayer money was involved. The owner of the solar panels, and the Canadian project they were exported to, is one of the world’s leading renewable energy investors, NextEra. And while Carney implies this was a hasty transaction, it was announced in 2010 (http://investor.firstsolar.com/releasedetail.cfm?ReleaseID=573598). Carney also references $15 million in loans from the State of Ohio, but those loans went to another manufacturer in no way related to First Solar. Finally, just to be clear, the solar panels are being used in a solar farm, not a wind farm, as Carney wrote. Such wanton disregard for the facts do the readers of The Examiner, as well as this blog, a disservice. Using a press release to plug a hole, so this is how they fix a leaking dam? Solar subsidies are stupid. Still, the solar guys are pikers next to the corn growers and mandated use of ethanol. The solar guys should have said they are harvesting sunlight, and gotten under the USDA wing, where subsidies are permanent. The solar guys had a bad business model of one-off subsidies. What a bunch of rank amateurs. I love blogging. In fact blogging is now my hobby.. Your attempt at defense of what you claim to be non-receipt of subsidy is at best weak, and at worst, lying. I would certainly recommend you address these purported inaccuracies with the author of the Washington Examiner Article, Tim Carney, beyond a letter to the editor ("Taxpayers did not finance solar farm in Canada"). So I would not be surprised if your "evidence" is highly questionable. Your counterparty in the solar farm transaction, Next Era, appears to be a significant subsidy recipient in Canada as well, so the identical "subsidy sponge" criticism applies there. Regardless of the veracity of the details of the St. Clair transaction, your firm, First Solar, is a significant recipient of subsidies, federal, state, and local. That is indisputable, as evidenced above. And that money is taxpayer money at risk.